We might have the technology to make autonomous cars today, but one of the largest stumbling blocks the tech currently has is the way it interacts with pedestrians and other road users. Signs we take for granted, such as waving or flashing are a signal of intent to other road users that autonomous cars simply can't comprehend accurately enough right now. According to Jaguar Land Rover, 41% of road users are worried about sharing the road with driverless cars – but it's come up with a solution. Currently being tested on autonomous pods and in a safe, controlled environment, the idea is relatively easy to understand. A beam projects lines in front of the car, and they fan left or right depending on where the car intends to go. What’s more, the gaps between the lines extend when the car is accelerating, and then compress when the car is braking - thus communicating the general intent of the car to other road users. The technology was developed by JLR – the pictures here show it used with Aurrigo’s autonomous pods – but there’s no reason we can’t see this tech migrating to Level 3 and above road cars. What are the levels of autonomous car? This isn’t the first system we’ve seen to help pedestrians understand autonomous cars. A few years ago, Nissan revealed a synthetic noise concept that would inform pedestrians when its electric cars were accelerating and deccelerating – just like an ICE car. 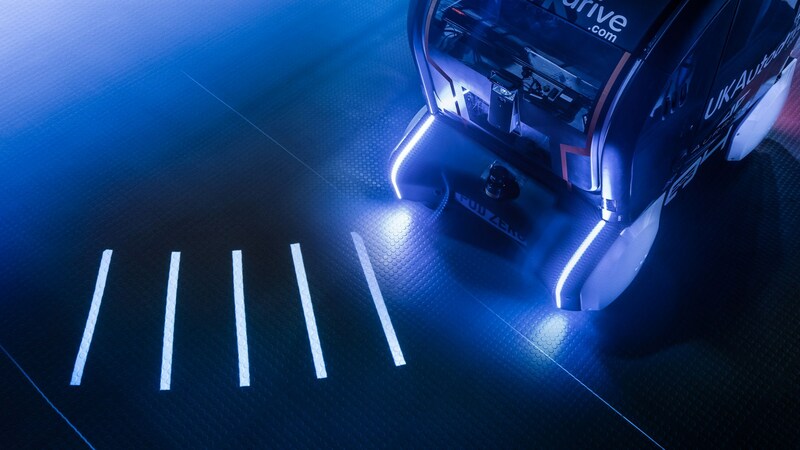 And at CES 2019 Audi revealed an altogether more sci-fi solution (pictured above), which used special lighting to show the proximity between pedestrians and autonomous vehicles. According to Audi, the feature isn’t there for safety as such, but is designed instead to reassure pedestrians that the car’s AI can detect their presence. It’s a question of trust, you see.